I enjoy work — I can watch people work for hours — but I am lazy myself, especially when it comes to cameras. I rarely want to carry a camera while travelling and when I do, I want something lightweight. On the other hand, I cannot see the point of taking photographs if I cannot hang them on the wall. I want to make poster-sized prints. If I am going to the bother of using a camera, I want top quality. For nine years I used Sigma cameras because I found nothing that could beat their Foveon image sensor for general-purpose photography — it is the sharpest sensor ever developed — and the closest equivalents were bigger, heavier, and costlier (see “Sense & Sensors in Digital Photography,” 18 October 2004, “Horsepower & Image Sensors,” 15 December 2007, and “How Not to Buy a Digital Camera,” 17 June 2010). However, times have changed. On my last holiday I was able to shed 13 pounds (6 kg) of kit — for the first time ever I did not carry a tripod — yet I got even better pictures than before. 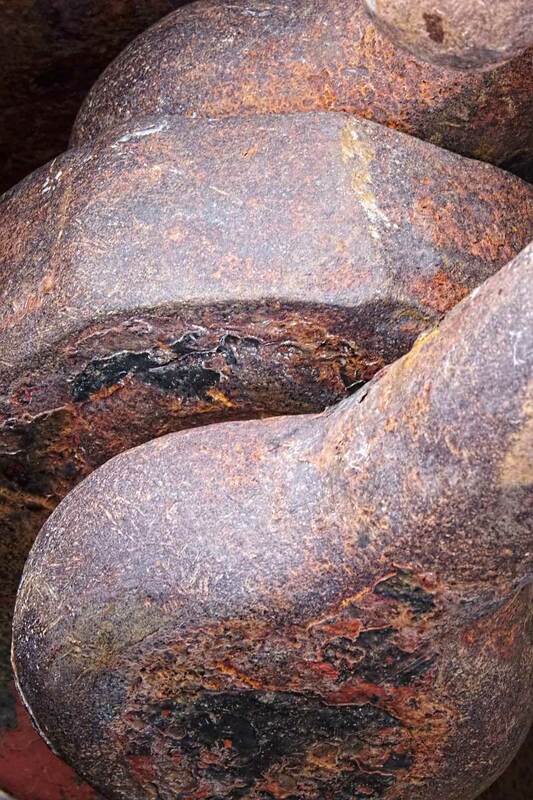 For an example of what this gear can do, take a look at this larger-than-life link of an anchor chain. 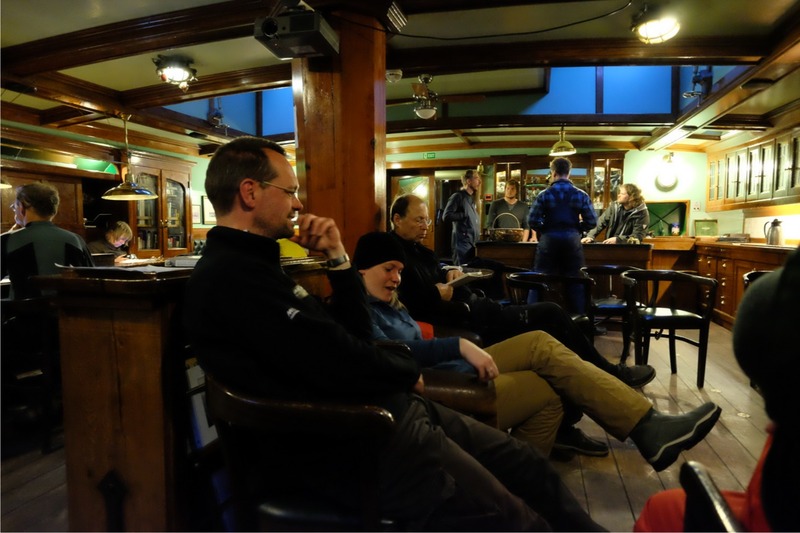 I am in Antarctic waters, standing on the deck of a three-masted schooner, the Oosterschelde. We are rolling gently. I am taking the picture with a very long telephoto lens, a lens equivalent to 300mm on a 35mm camera. I am as close to the chain as the lens will focus, which maximizes the effect of a shaking camera, and I am holding the camera in my hands. I cannot keep the image in the viewfinder still. To prevent blur with a film camera I would need to use a shutter speed of 1/500 second or faster. Using a digital with an ordinary anti-shake lens, 1/125 second would be possible, or maybe 1/60 second, but my camera is set to 1/15 second. In short, you are looking at a picture that ought to be impossible to take. I find it difficult to believe how clean and detailed the XE-2’s images can be at high ISO speeds. 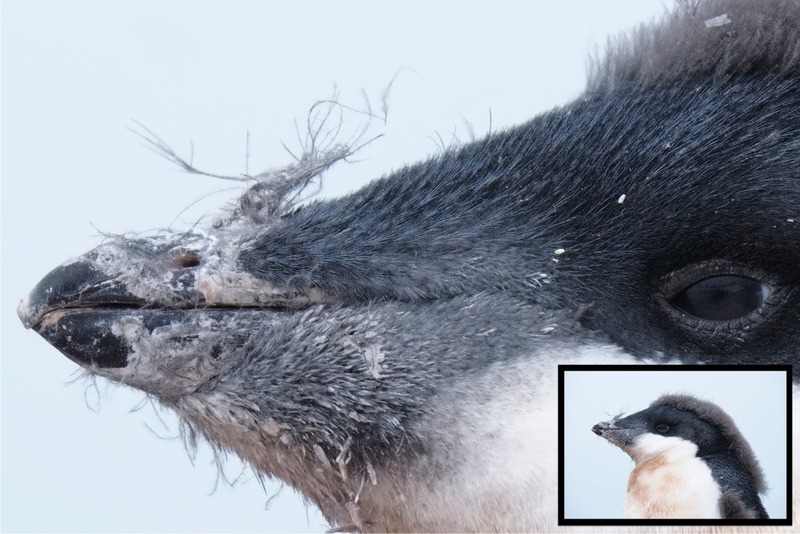 I shot this moulting penguin chick at ISO 1600. If your monitor is 100 dpi and you display this at 100 percent size, the complete image (inset) would be 4 feet wide (1.2 m). I did nothing to this picture save convert it from the raw file. Unusually low noise enables the X-Trans sensor to capture tones that are unusually dark. Indeed, I have rarely seen pictures that capture such a range of brightness, such a disparity of highlight and shadow. 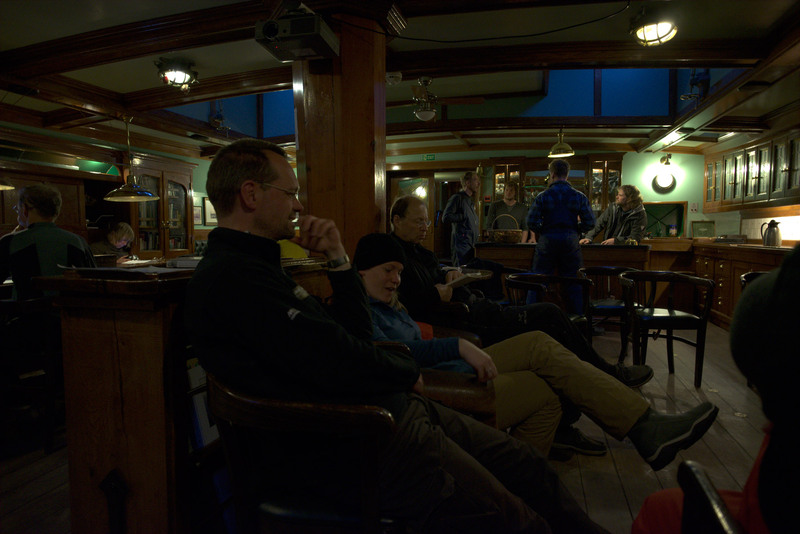 For example, here in the ship’s lounge at midnight the skylights illuminate nothing, the ceiling, walls, and floor reflect nothing, and the few lightbulbs are dim, yet ISO 6400 still captures almost the full range of tones in the scene, from bright pictures to black clothing in shadow. To create a JPEG image, the Fujifilm X-E2 modifies the tones in this raw image to make them more natural, throwing away lots of information along the way. Below is the best JPEG that the camera could create. I know it is the best one because the X-E2 lets you process raw files post hoc and try different settings. The JPEG above looks more normal, but dark clothes everywhere disappear into blackness. Also, its perspective is strange. The young woman’s head is too small and her legs are too long. This is from the optical stretching of a wide-angle lens. To make the good image above, not only did I need to use the full dynamic range of the X-Trans sensor, I also needed to normalize the perspective and trim the edges. To convert the raw image I used the raw converter Photo Ninja ($129), then I corrected the perspective and trimmed the image in Photoshop. The Software — Converting raw image files to viewable pictures requires a raw converter. The X-E2 comes with one, a free version of Silkypix. It does an excellent job converting raw files, and it automatically applies image-correction data supplied in the files by Fuji’s lenses, but it is slow and has an unintuitive interface that is remarkably awkward to use. 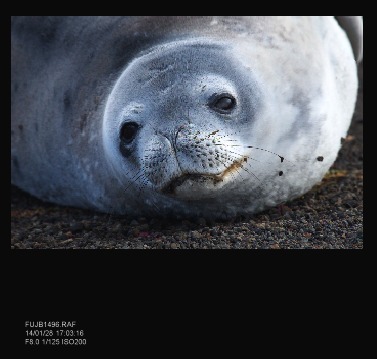 For example, here is a screen print from its file browser of a thumbnail image and its label. I can find no way to enlarge the label to make it more readable. I have also tried two other raw converters that apply Fuji’s image-correction data: Adobe Camera Raw and Iridient Developer ($75). Adobe’s raw converter cannot extract either the image sensor’s full dynamic range or its sharpness. Iridient Developer creates sharp images and captures the full dynamic range but leaves more noise than I like. Instead of these applications, I have found myself using Photo Ninja. Photo Ninja does not apply Fuji’s image-correction data but has easy workarounds. It functions as a standalone application and/or as a Photoshop plug-in, and it incorporates Noise Ninja, which is the best noise remover I know of. Photo Ninja also features a number of tools for editing photographs, but it is not a complete photo editor. I still need to use Photoshop, and I routinely rely on two Photoshop plug-ins by Topaz Labs, Adjust and Detail (see “Digital Ain’t Film: Modern Photo Editing,” 29 April 2010). Topaz Adjust (~$50) rearranges contrast across the picture as a whole. Used judiciously, Adjust adds unobtrusive modelling so that images show greater depth. With one slider you define up to 50 regions across the photograph. With another slider you set Adjust to equalize the picture’s contrast so that each region has a similar range of tones from black to white. Fully equalized contrast looks bizarre, but the slider lets you equalize the contrast partially. The glacier photo below shows the original photo on the left and the effect of Topaz Adjust in the middle. Topaz Detail (~$40) makes pictures clearer by boosting the contrast of details. It has separate sliders for fine, medium, and coarse detail, and it does not create artifacts. 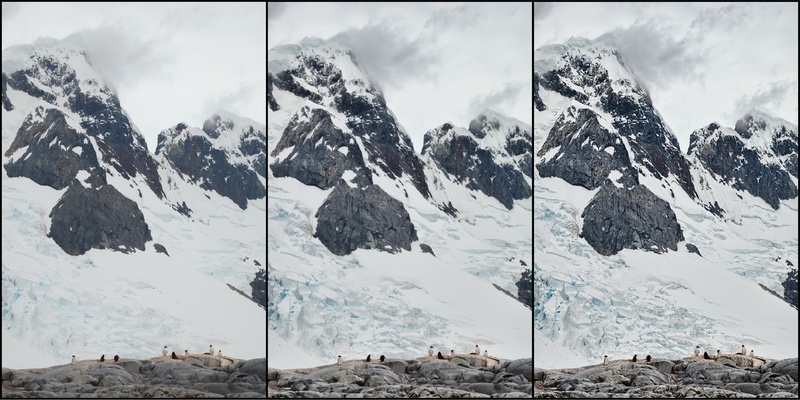 The image of the glacier on the right shows its effect when applied to the picture in the middle. Both Topaz products have a lot of other sliders and buttons, but none that I find useful. I think that some of the controls are gimmicks, and all the others have equivalents in Photoshop, where they work more quickly and are easier to use. Camera Controls — As I mentioned, I am lazy. I don’t mind editing photos on my computer in the comfort of my home, but I want to make life easy for myself while taking pictures. This is one reason I avoid JPEGs in favour of raw files. Avoiding JPEGs lets me ignore most of a camera’s settings, because most of the settings are for converting raw images into JPEG format and have nothing to do with taking pictures. Once I set the image-quality menu to “raw”, using the camera requires less thought. Once I do this, the X-E2 saves only raw files and, in theory, its controls for processing JPEGs have no effect. Yet in practice, as with most cameras, they do have an effect: they get in the way. For example, a button labelled Q (for “Quick”) brings up a menu to access 16 functions quickly. Of these, 14 are for processing JPEGs and so are useless to me. The 15th function is important: selecting ISO speed. However, it is so important that I configured a button near the shutter to access ISO speed directly. The only remaining function is also important — it brings up a menu for adjusting the brightness of the viewfinder and the display on the back — but it cannot be attached to any other button. To access this one function, I need to navigate past all the other choices in the menu. A sensible control structure for raw-image users would hide every function that applies only to shooting JPEGs. A sensible control structure would also let the user disable buttons. Some buttons are awkwardly placed such that they can be pressed accidentally while shooting, and I would rather such buttons do nothing instead of bringing up a distracting and unnecessary menu. Finally — this is a minor peeve but a pet one — sensible controls would permit selecting ISO speeds only in whole steps: 200, 400, 800, etc. The intermediate values are a relic of film, when each emulsion had a specific sensitivity that the exposure meter needed to match. In a digital camera, all this control does is adjust the gain on an amplifier, and the intermediate steps in gain are too fine to matter. I should not need to click through 18 menu items when only 7 are useful. For feature-counting reviewers who miss this unnecessary precision, the camera could offer the option in a settings menu. In general, the camera’s controls are not up to its optical engineering. Indeed, the controls appear to have been designed by the same committee that invented the camel while trying to redesign the horse. And as we’ll see, this committee had its hands in other parts of the X-E2 as well. Viewfinder and Focussing — The X-E2 can compete with the finest DSLRs on the market, yet it is not a DSLR. Its viewfinder is a screen, a high-resolution OLED display. It is large enough to see, yet not so large that the edges disappear when wearing eyeglasses. It refreshes fast enough to follow action and can be turned up bright enough to use comfortably in normal sunshine, although when I found myself surrounded by brilliant sun reflecting off the sea and ice, I did need to remove my sunglasses or shield the viewfinder with my left hand. It can also be set to display a useful set of information. All in all I find the OLED to be as functional as the optical viewfinder of my old APS-sized SLRs, and the lack of a mirror box makes the camera smaller and lighter. Its lenses are smaller and lighter too, because the rear element can be closer to the sensor. For focussing, a DSLR uses sensors in its viewfinder, where they must be positioned perfectly or, as commonly happens, they focus inaccurately. Instead, the X-E2 has them on the image sensor itself, where they can never be out of adjustment. Whenever the subject has some modest amount of contrast, the focussing system works speedily and well. Unfortunately, Fuji’s camel committee failed to design a system that can focus on a common subject that moves quickly: a bird. The continuous auto-focus is too slow and the manual focus cannot be used for the purpose because the focussing ring needs to be turned through awkwardly long arcs. Moreover — the kicker — turning the focussing ring automatically magnifies the image in the viewfinder so that whenever the bird is not dead centre, it disappears. The camel committee also hampered focussing in another way. I find that the surest way to focus the X-E2 is to leave it on manual focus, point a wee square in the viewfinder at what I want to focus on, and then push a button labelled AF-L. This focusses the camera quickly and certainly. Once the camera is focussed, it stays focussed however I frame the image, and the shutter responds with no delay. This design is excellent. However, near the useful AF-L button is another button that’s rarely needed. It brings up a menu to change the automatic focusing range from normal to close-up (which is erroneously labeled Macro). It’s all but impossible to avoid pressing the Macro button accidentally, which stops picture-taking dead. Fuji heard so many complaints about this on the preceding model that the company modified the firmware to permit disabling this button if you are not doing close-up work — and then they added a hump. If you disable the annoying Macro button, you disable the important AF-L focussing button as well. It seems apparent, by the way, that the members of the committee who redesigned this horse were too polite. If one of your pictures is slightly fuzzy, the camera avoids giving offence by refusing to show you this. In display mode it will not magnify images sufficiently to tell. Exposure — The X-E2’s automatic exposure works well enough for snapshots, but for careful work I find automatic exposure to be a nuisance, because I must continually review the exposure histogram and adjust the exposure-compensation dial. The X-E2’s manual exposure mode is simpler, because the viewfinder can be configured to show the exposure histogram in real time. All I need do is look at the histogram and set an aperture, shutter speed, and ISO sensitivity that has the histogram looking right. This I can do without removing the camera from my eye, because all of the information I need can be displayed in the viewfinder and the controls can be accessed by touch. However, the camel committee threw in yet another hump. For manual mode they created a “feature” that automatically adjusts whatever shutter speed I select by plus or minus one-third of a stop. I have no idea why they did this, but I find it amusing as well as annoying, because with this camera’s sensor, correcting exposure by one-third of an f-stop is no more meaningful than adjusting the length of a hem by one-third of an inch (8 mm). The most precise way to set the exposure is to have the histogram show that the brightest objects in the scene are not quite clipping (except for the sun and lightbulbs, and their specular reflections). Nothing else is so precise yet this still allows most of an f-stop’s slop in the highlights, and the sensor’s enormous dynamic range makes underexposure by one-third of a stop undetectable. Sensor Size — Many photographers dream of a camera with an image sensor the size of a 35mm frame, but I think the next size smaller is more sensible, the APS size used in the X-E2. APS-sized sensors allow bodies and lenses to be smaller and lighter in weight, they create smaller files, and — most important — they generate greater depth of field, which tends to make images look sharper overall. Although a larger format makes it easier to blur a background, doing this with the camera is a hold-over from film. Digital editing offers far more control. 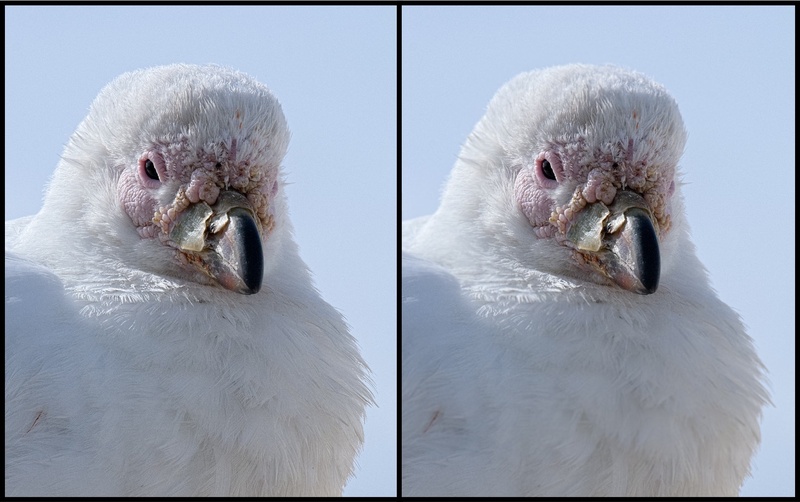 For example, imagine this snowy sheathbill flies into your Antarctic studio for a portrait. Like all vain birds, he wants the portrait to show off his face, not the back of his head or the feathers of the day. To this end you want to keep his face sharp but soften everything else. You want to soften most of his feathers gently and homogeneously, so that all of them still look like feathers but they don’t call attention to themselves. Selective focus is too coarse a tool to achieve this but the blurring tool in Photoshop makes it easy. Lenses — I have purchased four lenses for the X-E2: Fujinon 18-55mm (~$700) and 55-200mm (~$500) zooms, a Fujinon 14mm (~$700), and a cheap, third-party, full-frame fish-eye (~$325) sold under the Rokinon and Samyang brand names, and probably others. The two zooms have image stabilization that works a treat. The other two lenses lack image stabilization but cover angles so wide that camera shake is not much of a problem. The 14mm Fujinon offers both automatic and manual focus but Fuji’s camel committee decided that it should not support the useful focussing button. The Rokinon fish-eye is completely manual and cheap. Optically, the three Fujinon lenses are excellent — and to my surprise, so is the Rokinon. I much prefer it to any of the Sigma fish-eyes I have owned. For some reason that I do not understand, the X-E2 is supposed to have an old-fashioned appearance. To my eye it does not look remotely like any film camera I have ever seen, yet for some reason its supposed “retro” appearance is attracting customers. 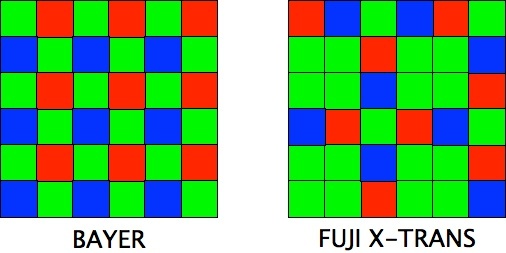 To further this perception, most of Fuji’s lenses for the X-E2 are not modern zooms, they have fixed focal lengths. Even more old-fashioned, none of them has image stabilization. Moreover, assuming the other lenses work like my 14mm Fujinon, they defeat the useful focussing button as well. They might measure a little better optically on a test bench, but image stabilization matters incomparably more for sharp pictures than subtle differences in optics, and a slightly wider aperture offers no significant advantage in a camera with an electronic viewfinder and usable ISO speeds up to 6400. The only fixed focal-length lenses I would consider for the X-E2 are extreme wide-angles. Fuji’s 60mm macro lens might also be useful for macro work on a tripod but for the field I think it more practical to screw a two-element +3 lens onto an image-stabilized 55-200mm zoom. I have found a Marumi DHG Achromat Macro 330 (~$85) to work nicely. Currently Fuji’s longest lens is 200mm. At first I lusted for a longer one for wildlife (one is promised for the end of the year), but I am no longer sure it would be worth the money and weight. A longer lens for wildlife would require at least the same shutter speed to stop an animal’s movement and a smaller aperture to maintain the same depth of field — two stops smaller when doubling the length of the lens from 200mm to 400mm. That would require two stops’ greater ISO speed: 3200 or 6400 instead of 800 or 1600. ISO 3200 and 6400 are noticeably noisier than ISO 800 and 1600. 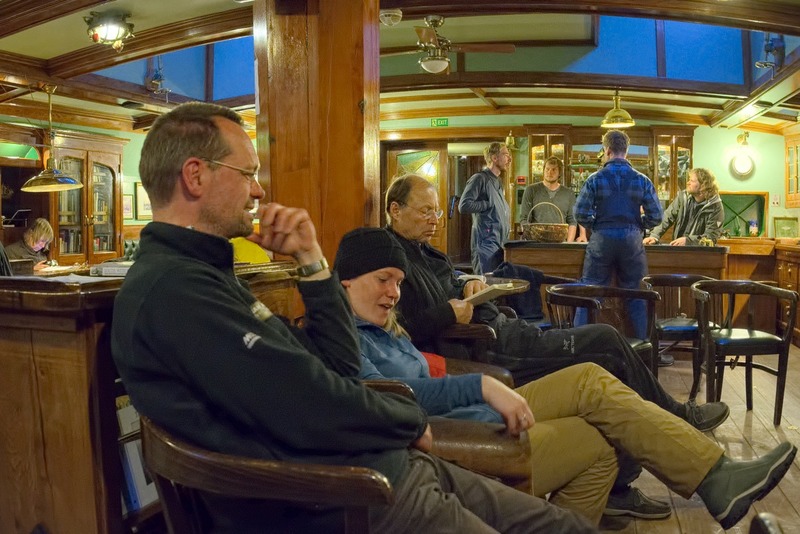 A cropped image at ISO 1600 might not be worse than a full-frame image at ISO 6400. I made a quick and dirty comparison of this with focal lengths of 100mm and 200mm, and saw no difference likely to be obvious below a print size of 16-by-24 inches (40-by-60 cm). The camera and lenses are reasonably comfortable to use, and are a delight to carry, but the small body is a bit awkward to hold, even with a grip. For use rather than carrying, a larger body would feel more comfortable. It would also be useful to have a brighter or larger viewfinder for use in brilliant sun. Fuji recently announced such a product, the X-T1 (~$1,300). It is weather-resistant as well, and the company plans to sell some weather-resistant lenses to complement it. I have no need for any of these but the system’s overall image quality is so high that if the new camera’s controls are more sensible, I just may be tempted despite the cost and extra weight. So nice. Been a subscriber to TidBits since ages, and all of a sudden a ship comes by ('Oosterschelde') I have been involved with since ages as well, since the start of the restauration in July 1988. And I am still working for the ship. Great article, thanks. I've been looking at the Panasonic GX7 and then the Olympus EM-5/EM-1. But then I picked up the Fuji Pro X-1 in our local camera store and gave it a test. One other small note. Topaz have a plugin Clarity which is a great alternative to Detail. I'd recommend it. Charles -- I always enjoy your articles and your take on digital photography. Here, you indicate that background blur is now best accomplished through software rather than employing a larger sensor and wide-aperture lenses. Having young children, most of my photography is now portraits, often needing fast, accurate focus in low light. I often like/need a blurred background, and am a bit lazy (like you). I wonder if in my situation you would still favor the X-E2 and having to digitally blur in post-processing, rather than a 6D and 85 f/1.8, e.g. While we're at it, is there a plug-in you recommend to simulate shallow DOF and nice bokeh? Thanks again for your work and insights. If your goal is to capture appealing snapshots, and if you want too many of them to take time over, then your best bet may be to open up a fast lens to blur the background. With a wide aperture it is important to focus accurately, and a fast lens also facilitates focussing. However, better pictures require more control. For better pictures it is easier to stop down the lens so that everything is sharp and to deal with backgrounds in Photoshop. Photoshop not only lets you control the amount and location of blur, it also lets you lessen distractions in subtler ways by changing brightness, contrast, and colours. If the lens is stopped down, then precise focus is less important, so that having a fast lens doesn't matter. From my perspective, distractions around a face do not usually vary systematically with distance, so I have never sought a plug-in that increases blur with distance as a lens does. Sorry, I can't help you there.